We’ve been providing studio-quality script support services since 1999, helping thousands of writers and producers towards their goals and discovering two Oscar-nominated writers along the way. If you handle scripts, books or screenworthy concepts within your own work, we can provide filtering, script consultancy and writer development services that can save you and your company significant amounts of time and money. We can handle scripts and treatments from £15 each, and books from £29 each! If you order over 100 scripts for our services, we will save you between £1000 and £11, 000 depending on the service you require – that’s a HUGE difference compared to your time or staffing to deliver this in house! We can provide submissions filtering from £15 per script (saving you £1414) or £29 (which would save £3030!) per book. You can also get Script Consultancy and Development from £69 per script or book which saves you £3030, too! We provide a dependable, reliable and insightful service to industry standard formats, with recommendations made to your specifications. If you handle over 100 scripts a year, then we can save you £1414 as well as the time and effort needed for you to hire and train staff for the job! If you provide us with a deposit of £250, you can send us as many scripts, books or concepts as you like – we’ll handle them all according to your own selection and development criteria and provide our feedback to you in industry-recognized formats. Compared to the value of your time and of hiring or training staff to cover the same need for you, we can save you significant sums of money, and provide a dependable, reliable and insightful service. The graphic below shows our offers and prices for the industry in 2017. All you need to do is provide a deposit of £250 to become eligible for these services at these hugely reduced rates. Every six months we’ll provide an update invoice, based on your projected submission levels for the year, and we’ll send a final invoice (or refund you the difference, if there is any!) for the full year of reports we’ve provided to you. Click on the image to see it at full size and full quality. Free up your time and resources for the things that really matter by taking up this offer now! 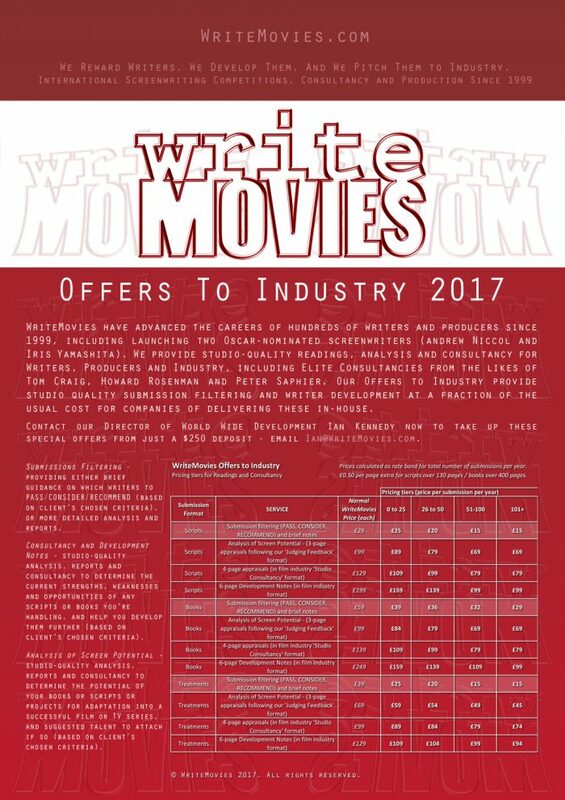 Contact our Director of World Wide Development Ian Kennedy on ian@writemovies.com for details.